Single line ascent, single rope technique (SRT), and from the grizzled vets “that new trash y’all been messin’ around with” – regardless of what you call it, the use of a single static line to ascend and even work the canopy of a tree is not only here to stay, but working out very well. While the idea of using single lines to access and sometimes work a tree’s canopy isn’t necessarily new to the tree care industry, recent developments in equipment, techniques and methods have made the use of single lines safer, easier and more efficient to a greater number of arboreal practitioners. Although single line can be effectively used to work the canopy of a tree, this column will focus more on its use as an ascent technique. One of the obvious advantages to single line ascent to frustrated throw bag manipulating arborists is that no isolation of the climbing line is required in a single line system. While there are many other advantages to single line ascent, there are also limitations. As with any tool or technique, understanding both the benefits and shortcomings of single line ascent will ensure that you will not only employ it properly, but also in the safest, most efficient manner. By its very nature, ascending a single line means ascending a static line. The other end of the line is secured in some manner – possibly as part of a ground-based rescue system in which the climber could be lowered back to the ground – allowing the climber to ascend the static single part of the line. This differs from the more conventional system in which two parts of the line are involved and both are moving, or dynamic. Dynamic systems provide a built-in mechanical advantage, requiring climbers to only lift roughly half their weight, as the weight is split between the two parts of line. However, with this advantage comes the attendant negative fact that the climber must move his hitch over twice as much line. Essentially, a 200-pound climber is only pulling up roughly 100 pounds, but has to move 2 feet of line, 1 foot from each part of the line, to ascend 1 foot. In static systems, such as SRT, the climber has to deal with all his body weight, but ascends at twice the speed of a dynamic system, or 1 foot of ascent for each foot of line moved through the hitch, device or combination thereof. As mentioned, using single line ascent techniques helps do away with all that tiresome throw bag manipulation to isolate a specific TIP before ascending. If the line is simply over a suitable branch or through an appropriate TIP, whether or not it’s isolated won’t affect the use of a single line ascent technique. In some cases, having the ascent line over a number of branches and TIPs may actually benefit the intended work plan. Ease of line placement does come with one caveat though: Users must recognize that they have changed, in some manner, the forces experienced at the primary branch or TIP. While further research may be necessary to accurately define how much or how little the forces have changed, it would behoove users to recognize that a single line ascent will put more force on the TIP than a dynamic doubled line system. Research and discussion are ongoing, and a better definition of exactly how much the forces may be different will hopefully soon become available. In the meantime, the safest course is to assume that the single line TIP will see roughly twice the weight of the climber with no magnification by drops, trips and falls. This is more than the conventional doubled line system in which the weight of the climber is split between the two parts of rope. Although this probable inherent disadvantage is certainly not a reason to avoid single line ascent, it is one to be aware of when deciding which branch or TIP is appropriate. This doubling of forces can be avoided by securing the single line to the branch or TIP itself, instead of passing over it, by sending up a running bowline. This will require isolating the branch with the line and will necessitate removal before descent. Another option, one that is removable from the ground, is the use of a midline knot, such as the alpine butterfly, where one end of the line is passed through the loop formed by the knot and then the knot is advanced up to the branch, cinching it in place, yet this also requires isolation of the TIP. These options also negate the use of ground rescue systems for the climber. The return of the nonworking end of the single line to the ground allows for the use of a friction-management or belay device. When appropriately anchored, this device allows the branch manager to lower an incapacitated climber from aloft safely and efficiently, providing enough rope is available. A number of devices are available that are appropriate in this application, but whichever device is employed, it should be securely backed up to avoid unintended slippage or loosening during the climber’s ascent. In addition, it should also have built-in safety features or add-on hitches added to prevent an uncontrolled descent during the lowering/rescue process. While this column focuses on single line ascent, a brief foray into the use of dynamic systems piggybacked onto single line static systems is appropriate, as this can also be used in the ascent. In short, these hybrid systems use a floating anchor point as a movable TIP on the single line, which can then be attached to the climber by some form of dynamic system. This type of ascent method provides the user with the advantages of efficiency in ascent of single line, while allowing the switch over to a dynamic system with two moving parts of rope for canopy movement. Once again, factors such as forces at the tree’s TIP, security of the floating anchor point, and the appropriateness of the device/hitch being used as a floating anchor point must all be considered and evaluated prior to use of such a hybrid system. Systems and equipment that can be used for ascending a single line safely range from the simplistic single line footlock on a Prusik to systems involving multiple ascenders, Petzl I’D, PMI chest rollers, ISC rope wrench or RopeTek Hitch Hiker, or a combination thereof. While many of the ascender options are meant for use only in the ascent and are removed once the desired elevation has been reached, devices such as the ISC rope wrench and the RopeTek Hitch Hiker can be left installed on the single line to work the canopy and eventually descend – all on a single static line. Regardless of which system, or combination of systems/tools, is chosen, new users would be well-advised to have extensive training and practice with the chosen system/device “low and slow” prior to venturing high into the canopy. Eighty feet up in a white oak is not the place to discover you’re not really sure why something is slipping or not releasing. Every climber should have the understanding and safe use of single line ascent techniques in their mental toolbox, ready to deploy in the appropriate scenario. While no solitary system or technique is perfect for every tree and situation, the increased efficiency, and thereby saved climber energy, of single line ascent make it a system that climbing arborists should at least explore and try. The more techniques in that mental toolbox, the more prepared the crew is to safely and efficiently meet what challenges the boss – or the tree – throws their way. Michael (House) Tain is a contract climber, splicer, educator and writer associated with North American Training Solutions/Arbor Canada Training and Education, currently located in Lancaster, Kentucky. The Tree Care Industry Association (TCIA) conducted an analysis of 37 civilian tree care-related accidents reported by the media in 2014. TCIA is a trade association that advances the tree care industry and discourages homeowners from taking unnecessary risks caring for their trees. 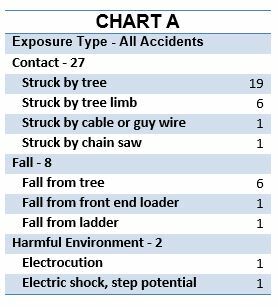 While these numbers are not representative of all – or even most – tree care accidents involving non-professionals, they provide insight into the types of hazards hom eowners are likely to encounter while attempting tree work. The median age of the victim was 62, and the oldest victim was 76. The youngest reported victim was a 3-year-old toddler who tragically walked into the path of a tree his father was felling and was struck and killed. Three of the 37 victims, including the 3-year-old, were uninvolved bystanders. Most homeowners were struck by a tree while attempting to fell it, or were hit by limbs, wires, or chain saws. Others fell or were electrocuted. Chart A provides more details on the accidents. Occasionally, these incident are high-profile; Greg Norman, the pro golfer, is the lone “struck by chain saw” statistic. He claimed to be lucky to still have his left hand after a chain saw accident. The famed Australian, who won two majors and 20 U.S. PGA Tour titles, was trimming a sea grape tree at his home near Jupiter Island, Florida, when the accident occurred. Norman was part of another dominant group in these statistics: the victims who were working alone at the time of the accident. In two-thirds of all cases where it could be determined, the victims undertook hazardous tree work with nobody to spot them, nobody to assist them, and nobody to advise them when it might have been prudent to stop and seek out an expert.